Cnoc Fírinne is strongly associated with fairies. Mentioned in Aodhagán Ó Rathaille's poems and in the Fionn tales, it was regarded as the seat of a deity or fairy-king called Donn Fírinne. It was also the focus of a Lughnasa gathering. It seems that Fíreann ('truth') is a re-interpretation of an old personal name Frigriu, with genitive Frigrinn. For origin of name, see Ó Maolfabhail, LECL. See Máire MacNeill, 'The Festival of Lughnasa' (pp. 201-06) for details of the festive assembly on the hill. Locally also spelt Knockfierna. Knockfeerina is the 1179th highest place in Ireland. 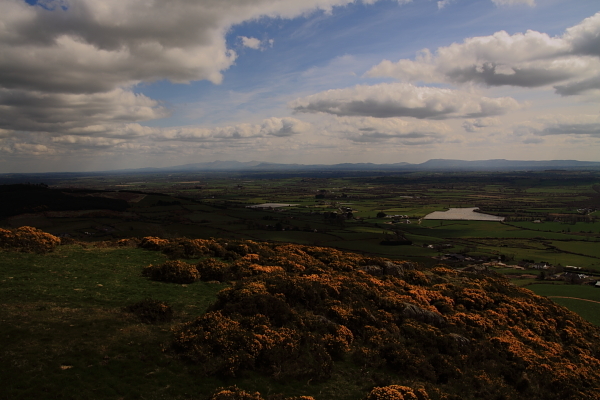 Knockfeerina is the most northerly summit and also the most easterly in the W Limerick/N Kerry area. Knockfierna is a lovely little hill, easily accessible and with great views, as well as plenty of historical and folklore interest. Its well located in the centre of county Limerick and is close to both the N20 Limerick-Cork road and the N21 Limerick-Kerry road, so a good diversion if you happen to be passing nearby with a couple of hours to spare. I randomly found a description of a route up from the village of Ballingarry online (http://www.barnalick.com/PDF/Knockfierna.pdf), so I decided to investigate on the way home from a couple of days spent on Mweelrae and the Twelve Bens. There's plenty of parking around Ballingarry, such as by the town park at R4140 3626 F. Head up through the town and along the R518 Kilmallock road. Turn left off this road soon after leaving the town, at R4194 3567 C, opposite a right turn and a 'welcome to Ballingarry' sign, over a stone stile, up a gated track. When you come to a new cowshed in front of you, take the track to the right and follow this up past a few gates until you join up with a track, known as 'The Red Road' coming up from the right. You could also follow this track up from the main road, but it would require an extra bit of unnecessary road walking. This track will take you all the way to the summit, along a broad, gorse covered ridge, passing a number of thatched cottages, mostly in ruins, and a famine memorial stone along the way. When you pass through a gate just before the summit 'pinnacle', take a right turn and you're on the summit in no time.